The suicide-bomb attack on the Boys’ Science and Technical School (a secondary school) in Potiskum on 10 November, which claimed nearly 50 lives, has once more put Boko Haram and the conflict in northern Nigeria in the international spotlight. The last time the rest of the world paid much attention was when more than 200 girls were kidnapped from a school in Chibok. 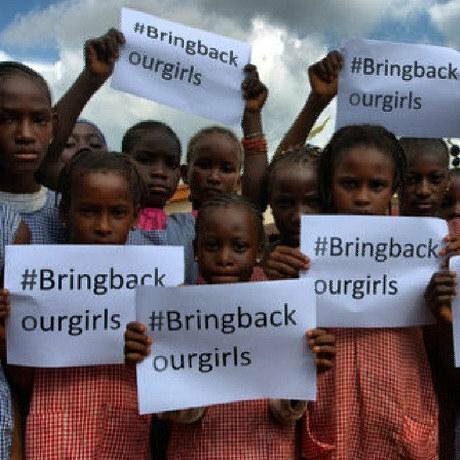 The #BringBackOurGirls hashtag went global, as world leaders such as Barack Obama and David Cameron signed on, and the “Chibok girls” suddenly gave the conflict a face. Subsequently, Nigeria’s president, Goodluck Jonathan, promised to leave no stone unturned in bringing home the abducted girls and defeating Boko Haram. Other countries, including the UK, US and Israel, offered technical intelligence support. It might have been thought this international focus would force the government to come up with a better and more co-ordinated effort. Viral hashtag: girls in Conakry supporting their kidnapped sisters in Nigeria. Unicef Guinea / Flickr. Some rights reserved. Boko Haram has however not been weakened. On the contrary, the insurgency is stronger than ever. Before Chibok, the organisation had been pushed out of Maiduguri (the provincial capital of Borno state) and could only operate freely in remote border areas towards Cameroon and Chad. This has changed. During the summer and autumn Boko Haram went on the offensive, capturing territory and cities in Borno and in neighbouring Yobe and Adamawa. While the Nigerian army has been weakened by mismanagement, lack of military equipment and falling morale among the troops—leading them at times to abandon position facing Boko Haram advances—the insurgents have been so emboldened as to declare a “caliphate” in the areas under their control. The Nigerian state’s approach to the conflict has been haphazard from the outset. The three northern states most affected do not matter much economically. And there is a power struggle between northern and southern elites for control of the country’s dominant political force, the People’s Democratic Party (PDP). So even if Boko Haram is taking a terrible toll, the main item on the agenda in Abuja is not how to solve the crisis but who will stand in next year’s presidential election—with some claiming Jonathan wants to take the presidency back to the south permanently, ending its conventional rotation. There is an indirect connection between the north-south divide—and the associated bitter conflict over positions, power and money—and Boko Haram. Although the north is mainly Muslim and the south predominantly Christian, this is in essence not a religious cleavage: it evolves around everything from access to land and politically secured offices to the distribution of oil revenues. Embedded as it is in state institutions, including the police, the military and the political parties (including the PDP), this division has clearly limited the state’s capacity to engage in a concerted attack on Boko Haram while protecting local communities and the educational facilities the insurgents so frequently target. This was evident before Chibok but is even more apparent as the country moves towards the primaries through which the parties choose their presidential candidates. On the other side, Boko Haram is good at what it does and is more than just a group of gun-crazy, violent, religious fanatics. It is well-organised: at its core is a tightly-woven group of insurgents, mostly but not exclusively originating among the Kanuri people. Kin networks in this ethnic group has made it possible for Boko Haram to establish flexible and pragmatic cross-border links to Cameroon and Chad, for sanctuary, trade and commerce. This does not imply broad support for Boko Haram among the Kanuri—there is not much evidence for that. Traditional livelihoods are under immense pressure in the borderland, however, due to the desertification caused by the drying up of Lake Chad. Given the irrelevance if not absence of the state in this context, some will take whatever possibilities for generating income come their way, including trading with an organisation such as Boko Haram. In addition to the insurgents in the field, Boko Haram has established “sleeper cells” in the major towns of northern Nigeria, as well as in cities further south. Few of these know much about the rest of the organisation. Sometimes they are activated by remote control; at other times they operate independently but hit targets generically identified by Boko Haram: schools, businesses offering “un-Islamic” goods and services (beer gardens, for example), government facilities or other infrastructure. Boko Haram’s fighting capacity is bolstered by mercenaries from Chad who do not necessarily share its political and religious objectives. Most belong to groups who previously fought the long-running Chadian president, Idriss Déby, and live on the margin of their state. They do not care much about whom they assist, or if that assistance means they have to fly the black flag of Boko Haram, as long as they get a fair share of the loot and can bring it back over the border. Operating with or pretending to be Boko Haram is even an advantage for these mercenaries, as it means they avoid attention. And from the perspective of Boko Haram the insurgency appears larger and more powerful than it is. Boko Haram is good at what it does and is more than just a group of gun-crazy, violent, religious fanatics. In the absence of legitimate state presence on the ground, Boko Haram is also a difficult organisation to fight. It is quite self-sufficient, financed by bank robberies and cross-border trade. Such cash transfers leave little if any electronic trace, so the international security operatives who are supposed to assist the Nigerian government cannot achieve much. Improved intelligence is clearly needed but this is not an insurgency that can be tracked from afar. What is needed is ground-level information but local people are often just as afraid of the Nigerian army and police as they are of Boko Haram. With an increasingly strong insurgency and a weak state, they are caught between a rock and a hard place—with few alternatives apart from seeking refugee elsewhere or attempting to negotiate their security with the agents of violence who appear most powerful. In early November there were suggestions of official negotiations with Boko Haram in Chad. But it is entirely unclear who the Nigerian government was negotiating with, if talks ever took place. As the country moves towards the 2015 elections, more rather than less violence can be expected. Nigeria has a long history of violence associated with elections and these could prove the most violent ever. Only if the government performs a U-turn and rapidly transforms its misguided policy towards the north—emphasising human security as its priority—can this vista be avoided.